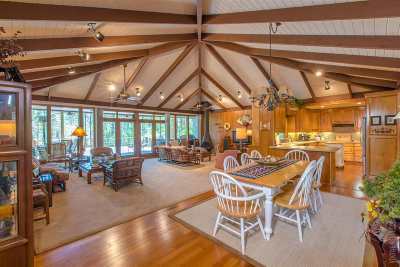 Experience the best Lake Sam Rayburn has to offer with this fully furnished waterfront lake Lodge. Stepping into the lodge on the main floor you&apos;ll find yourself in a sunlit atrium which brings the outside in. The main floor hosts 3 bedrooms, two baths and a game room with a bar and yes, the pool table is included. The upper level includes a master suite, kitchen, dining and living room which has gorgeous views that extend out to the large deck. The bottom floor is currently being used as a bunk room with 5 beds, another full bath and perfect area for entertaining. Adjacent to the bunk room is a combination utility room/butlers&apos;s pantry with a plethora of storage and a full bath. The floorplan is a must see and was once named Better Home and Gardens floorplan of the year! Perfect getaway for large groups.